Already up-front and easy-drinking, with a surprising lack of depth and concentration, the 2008 Cote Rotie la Mouline gives up plenty of peppered game, underbrush, and sweet fruit to go with a medium-bodied, elegant and straightforward profile on the palate. While I think it will still be better in a couple of years, it’s easily the weakest la Mouline in over a decade and will need drinking in its first 10-15 years of life. In contrast, a recent bottle of 2008 La Torque delivered noticeably more depth and concentration. Jeb Dunnuck. 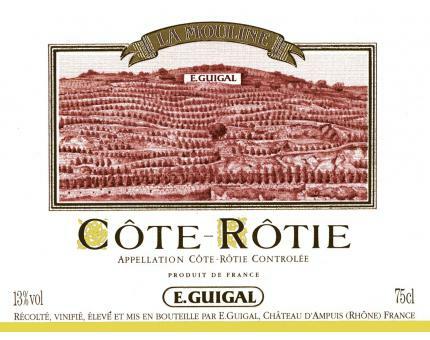 The weakest link among recent vintages, the 2008 Cote Rotie La Mouline reveals a weedy, green pepper note along with sweet tannin, a medium dark plum/ruby color, and a gentle roundness and lushness. By the time this cuvee is in bottle, I suspect it will be better than it was showing in Guigal’s cellars. Robert Parker. An alluring wine, with steeped currant, dark truffle, roasted apple wood and espresso aromas and flavors all mingling together, backed by a solid spine of charcoal and ganache notes. A sanguine edge runs underneath and should emerge more as this softens in the cellar. Best from 2013 through 2025. 415 cases made. James Molesworth. Plus parfumée que ses deux consœurs, comme toujours, un délié élégant et sans creux, une texture juteuse gourmande, elle vieillira bien.